The Great Rift Valley of East Africa—the birthplace of the human species—may have taken much longer to develop than previously believed, according to a new study published this week in Nature Geoscience that was led by scientists from James Cook University and Ohio University. 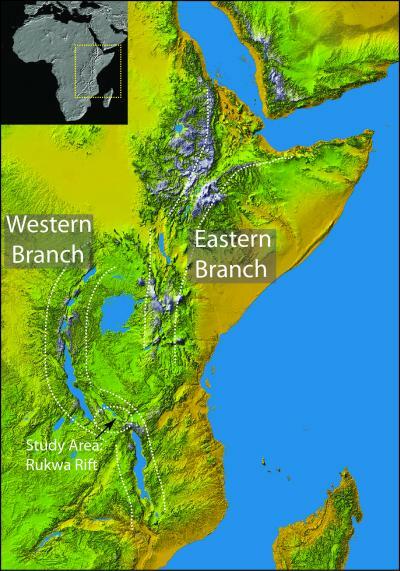 The team's findings suggest that a major tectonic event occurred in East Africa as far back as 25-30 million years ago, rearranging the flow of large rivers such as the Congo and the Nile to create the unique landscapes and climates that mark Africa today. "The findings have important implications for understanding climate change models, faunal evolution and the development of Africa's unique landscape," said lead author and geologist Eric Roberts of the James Cook University in Australia. The Rift is an example of a divergent plate boundary, where the Earth's tectonic forces are pulling plates apart and creating new continental crust. Scientists such as Roberts and his Ohio University study co-authors Nancy Stevens and Patrick O'Connor have found the area to be a rich source of fossils, including of some of the earliest anthropoid primates. "This formation is the only late Oligocene terrestrial fossil-bearing deposit known from continental Africa below the equator," noted Stevens, who leads the paleontological team focused on the Oligocene, a geological period 23 to 34 million years ago. "It has already produced several species new to science, and is particularly significant because it provides a last snapshot of the endemic African forms prior to large-scale faunal exchange with Eurasia later in the Cenozoic," continued Stevens, an associate professor of vertebrate paleontology in Ohio University's Heritage College of Osteopathic Medicine. The traditional view holds that the eastern branch of this region is much older, having developed 15-25 million years earlier than the western branch. Using an approach that included the dating of multiple minerals, such as zircons, contained within sandstones exposed in the western branch of the rift, the research team was first able to constrain the age of formation of the individual minerals and then use this information to estimate potential igneous source rocks that must have eroded at different points in the past to generate the sedimentary rocks. 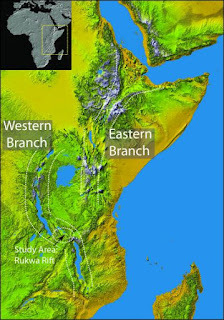 The team's work provides new evidence that the two rift segments developed synchronously, nearly doubling the initiation age of the western branch and the timing of uplift in this region of East Africa.